Our mission is "To make the horse accessible to all ages, genders, abilities, etc. that show an avid interest in lessons, how to ride and/or enjoy the horse to suit them." Welcome to True Love Arabians! True Love Arabians in Buffalo, Minnesota is a year round working horse operation. It involves 7 days, 24 hr. dedication to the care, raising and training of it’s over 40 owned and boarded horses. As many as 40 others were born, raised and started under saddle here. Over 20 others were owned and kept for a number of years then sold to clients for their children or for adults to enjoy for years to come. Join the new wave of Horse Lovers who want a better, easier way no matter how old they are. Working with understanding and riding horses helps prepare you for the future. It makes you stronger mentally and physically, builds character, perseverance, ability to accomplish and many other attributes to use throughout life. Children who have time for horses very seldom have time for trouble, drugs, and other negative forces. 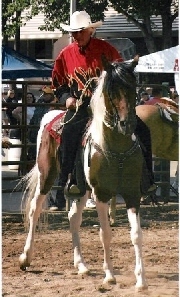 Horses have been used for hundreds of years in physical and mental therapy. There is an endless truth to the statement "There is nothing so good for the inside of a man (woman or child) as the outside of a horse."